Rugby, TN (November 26, 2018)—On the first two Saturdays in December, the historic settlement of Rugby, Tennessee, will come alive with Christmas spirit and celebrate the holidays as if it were still 1880, the year the town was settled. 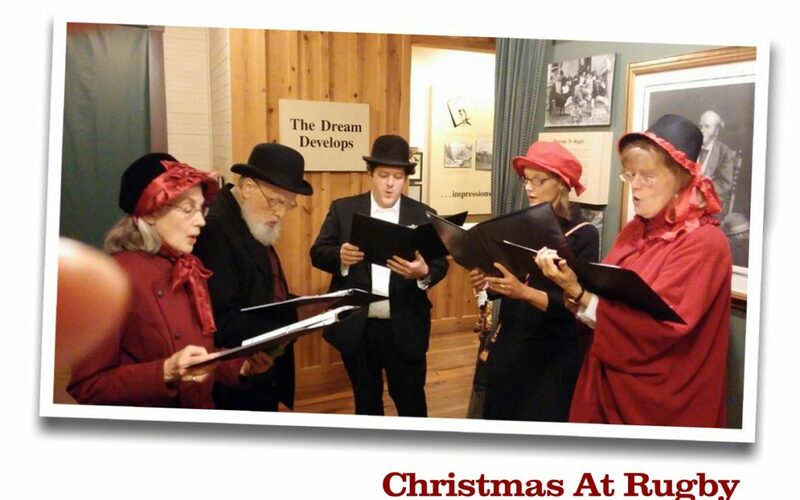 Highlights of the Victorian Christmas celebration include holiday music, hot drinks and cookies in the decorated historic buildings, a visit from Father Christmas and the sounds of carolers performing throughout the village. Historic Rugby and the Morgan-Scott Project have also teamed for a gift drive directed at teenagers. Most toy drives collect gifts for younger children, and the organization finds itself short of gifts for needy teens. Visitors may drop off donated gifts at boxes throughout the village. Festivities run from 4 until 8 pm Eastern. Admission is $10 adults, $6 for Historic Rugby members, and $4 children K-12. In addition, the Harrow Road Café will host its traditional Christmas Dinner on both Saturdays. Reservations are available from 5:30pm until 8:00 pm (all times Eastern). The Café will be offering a choice of Slow Roasted Beef or a Special Recipe Glazed Ham, a holiday soup, and a traditional holiday dessert. Reservations are required. Cost is $30 per person. To make reservations, call 423-628-2441. Rugby was founded in 1880 with the goal of building a strong agricultural community through cooperative enterprise, while maintaining a cultured, Christian lifestyle, free of the rigid class distinctions that prevailed in Britain at the time. The village has continued for over 135 years, with numerous original buildings either restored or recreated. Learn more about the history of Rugby and its unique attractions at www.historicrugby.org.